Way back in 1983, when Laser Disc was just born a little movie by Richard O'Brien was one of the first ever UK releases. 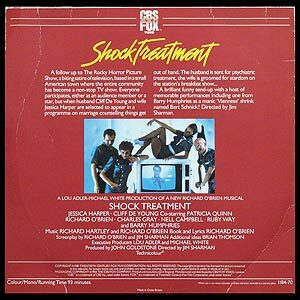 More than twenty years later, DVD has taken over and the UK Shock Treatment laser disc has now become one of the rarest Rocky related items anywhere. 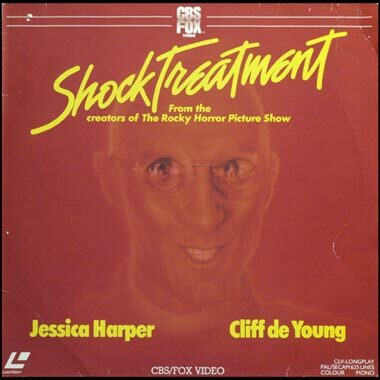 Shock Treatment wasn't quite the follow up that Richard had written to the Rocky Horror Picture Show, by the time it was filmed the original idea for a sequel had changed beyond recognition. Having said that 'Shocky' is still a fun musical and pokes fun at the television nation America was beginning to become. Long before 'Big Brother' and the raft of reality television that has now taken over our screens, this movie tells the continuing story of Brad and Janet as they seek to save their marriage by appearing on a television game show called 'Marriage Maze'. With a wonderful performance as 'Burt Schnick' by Barry Humphries, better know as Dame Edna Everage, this is a rocking musical from our favourite writers. Trivia fact: The UK disc was the best resolution version of the movie to watch at home, until the DVD's were release in 2006 that is. A follow up to The Rocky Horror Picture Show, a biting satire of television, based in a small American town where the entire community has become a non-stop TV show. Everyone participates, either as an audience member or a star, but when husband Cliff De Young and wife Jessica Harper are selected to appear in a programme on marriage counselling things get out of hand. The husband is sent for psychiatric treatment. the wife is groomed for stardom on the station's breakfast show. A brilliant funny send-up with a host of memorable performances including one from Barry Humphries as a manic 'Viennese' shrink named Bert Schnick! Directed by Jim Sharman.